Cassie and Braxton at the Midnight Madness Race in 2017, our favorite event to run together. 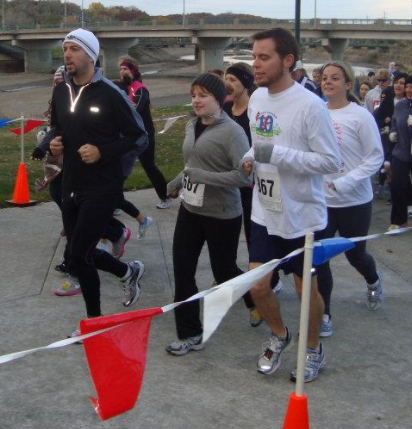 I didn’t start running until I was in my 30s, as a lifestyle change after a health scare. My friend, Braxton Pulley, DC and owner of East Village Chiropractic, was one of my biggest supporters as I learned how to run safely. He’s also helped me through a few slumps, injuries, and disappointments. 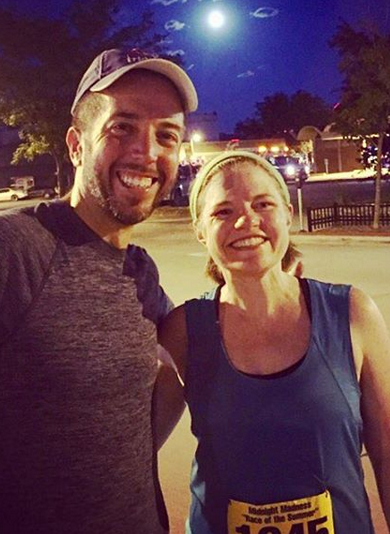 With so many of our East Village Spa guests and his chiropractic patients training for races this season, I asked him to share advice to keep you runs safe and fun! Q: Is running safe? Research seems to disagree. Q: What are the most common injuries you see in your patients who are runners and what can they do to help prevent them or recover from them? A: Hip pain-focus on stretching your hip rotators, hip flexors, and hamstrings. Knee pain-most knee pain related to running that my patients present with tends to be from the IT band on the outside of the thigh. Massage can help. Plantar fascitis-this primarily stems from lack of stretching the calf. 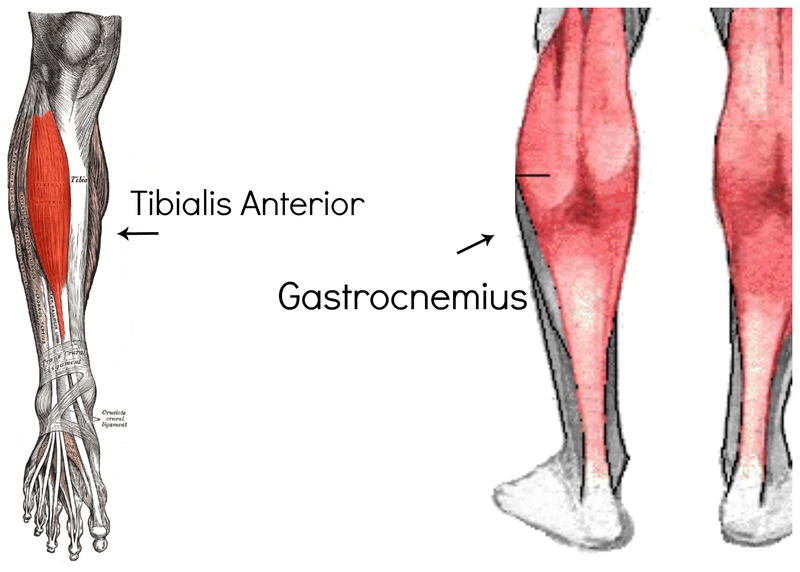 Stretch both the gastrocnemius and the soleus to help reduce likelihood of this injury. Q: Should I stretch before or after I run? A: This is the age old question. Recent evidence is showing that there is no benefit to stretching beforehand and some studies show stretching before running can increase the possibility of an injury. I think the entire argument is off-base. Warm up and cool down for your runs, but stretch every single evening, regardless of whether you have worked out that day. It can take a few days for muscles to tighten up, and stretching right after a run won’t do a lot for the soreness you may have 2 days later. Q: How can someone safely start running? A: The key is patience and setting a long term goal. It takes awhile to train your muscles and your lungs so be patient and persistent. There are a lot o f programs out there, but I have seen the “Couch to 5k” type program work well with many of our patients. My first 5k with Dr. Pulley and my husband. I finished with a pace over 12 minute miles, but this accomplishment was as exciting as my first half marathon. In running, every milestone is a victory! 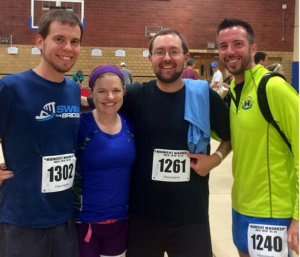 Q: What is your advice for dealing with the setbacks that are inevitable for runners? A: Setbacks are going to happen. Injuries, weather, motivation, life…they happen. When it comes to running, enjoy the journey. When you can’t run, keep your mind in the game by using other aerobic activities (as tolerated) like swimming, biking, rowing, etc… This will also help keep your lungs engaged. When you are ready to run again, start slowly and work your way back to where you were. I think you’ll find that you recover much quicker than you think! Whether you’re contemplating starting to walk or jog or you’re a seriously competitive runner, massage therapy and chiropractic care can help you achieve your goals. I’ve been fortunate to have advice and support from Dr. Pulley in my athletic endeavors. If you can’t make your chiropractor your running buddy (which is pretty convenient, I’m not going to lie!) at least turn to them for advice. To learn more about Dr. Pulley’s services, click here. If you’d like to schedule an athletic massage at East Village Spa to support or reward your training, click here. When I was in my early 30s, I knew I needed to get fit. I grew up swimming but didn’t know how to ride a bike and couldn’t run a mile. The first time I ran a full lap around Gray’s Lake (1.9 miles) without stopping was as exhilarating as my first half marathon. I learned how to ride a bike in in my quiet neighborhood after dark so little kids wouldn’t seem me wobbling around on two wheels. While I crave regular workouts now, I totally get how awkward it can be when you are just getting started so I wanted to share a few ways I’ve found that are comfortable for people of all fitness levels, especially people just starting out or getting back into the swing of things after a long hiatus. I still swim, and I learned to love running. I can bike well enough to complete triathlons, but biking on streets terrifies me. Not learning how to ride until late in life means I still almost fall off my bike every time I stop and can’t stand up to pedal, weird things most people take for granted. My friend Katy gently nudged me to try the Des Moines City Ride last night after several people told me this was an awesome way to get comfortable biking around Des Moines. 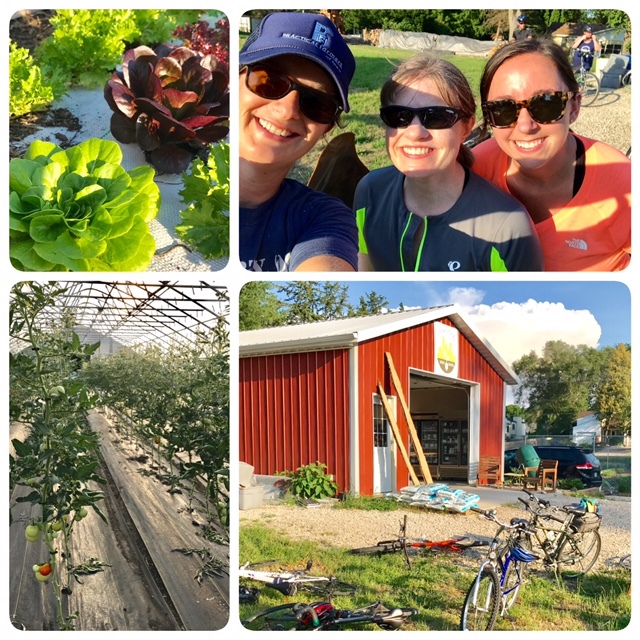 Last night we met at Westchester Park on Aurora Avenue and biked as a group to Dogpatch Urban Gardens which will be my new favorite place for produce! It was awesome! The ride was a nice slow pace so nobody was left behind, great practice biking on streets, family friendly, and everyone was encouraged to use proper signaling. 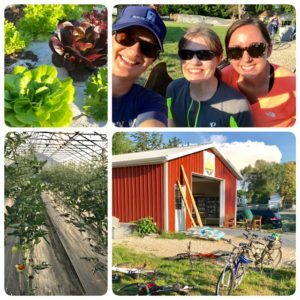 I was able to meet new people and catch up with friends while biking. The group meets most weeks on Mondays to explore a different neighborhood, but check their facebook page and website for the up-to-date schedule. During regular pool season, Ashworth pool offers lap swim only hours from 12-1 daily. The hours are not well-published so there is usually not a crowd. For newer swimmers, Ashworth’s lap swim time offers a comfortable space to practice without dodging kids and families. The 50 meter length is great if you dread turns and swimming outdoors helps make getting in a workout more of a treat and less of a chore, especially if you use the last part of your visit to enjoy quiet time on the pool deck while you dry off. When I make it to lap swim, I usually notice a range of abilities, from new swimmers and senior citizens just covering a couple lengths of the pool, to triathletes and college athletes training in the off-season. Everyone just does their own thing and has plenty of space. I’ve always been a fan of Fleet Feet Sports and their run programs and social runs. The employees and volunteer mentors for Fleet Feet are the kindest, most supportive people you’ll ever meet and they welcome both new and experienced runners and walkers to their programs. Whether you’re running to get ice cream or beer, training for your first 5k or your 50th marathon, they have something you’ll enjoy at just the right pace. They’ve even started doing social runs in other areas of the city. 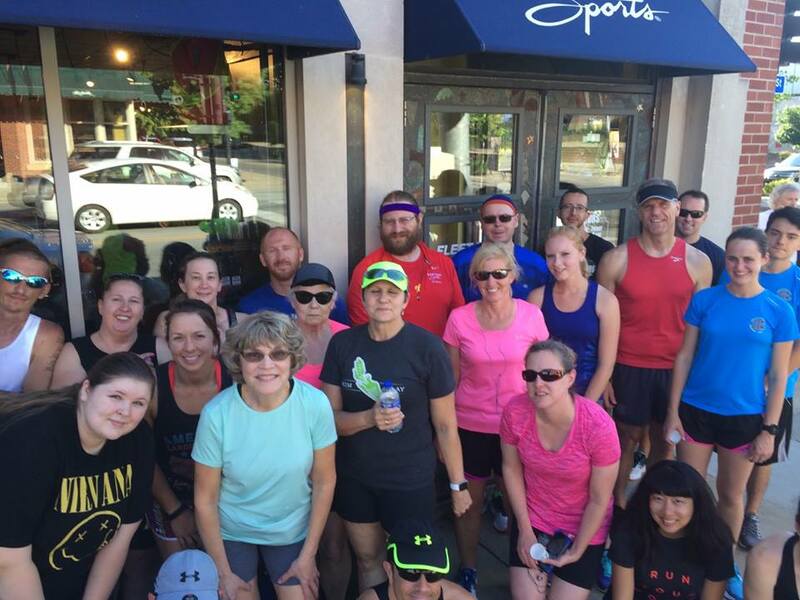 Check the Fleet Feet Website page for their upcoming events or stop into the store where they will be happy to invite you to join the fun! Prefer an indoor workout? I’ve found the team at the South Suburban YMCA to be exceedingly welcoming to people of all fitness levels. Some of our spa guests who have never gone to a gym have found a great home at the South Suburban Y and look forward to lap swim, water aerobics, spin classes, and individual workouts. If you’ve never been a “gym person” this might be a good place to start. 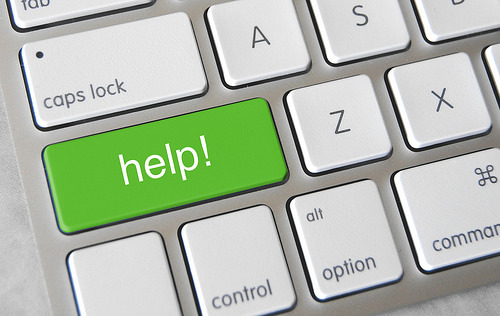 Wherever you start out, we’re happy to help you on your journey! Book a massage to help with aches and pains, or any spa service as a healthy reward as you progress toward your fitness goals! June 21st is the 2016 International Day of Yoga. 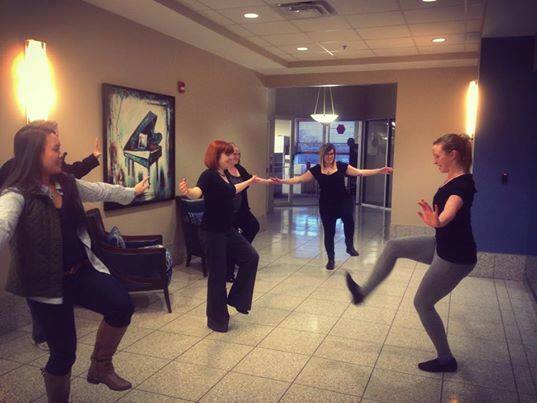 Many of our team members and clients benefit from their regular yoga practice. We wanted to share some of our favorite local yoga instructors and some ideas for experienced and new yogis alike! Our esthetician, nail technician Hannah recommends Ben Spellman from Good Vibes Yoga, with classes throughout Des Moines and at Shakti Yoga. She also recommends Brette’s classes at Shakti Yoga. For a different twist on Yoga, she also suggests trying the acro yoga classes at Power Life led by Brett Aronson and Tiffany Thomas. Our massage therapists Tiffany, Jamee, Camdine love going to Ofelia Moore’s yoga classes. If you’re completely new to yoga and find it a bit intimidating, a good place to start is your local YMCA. 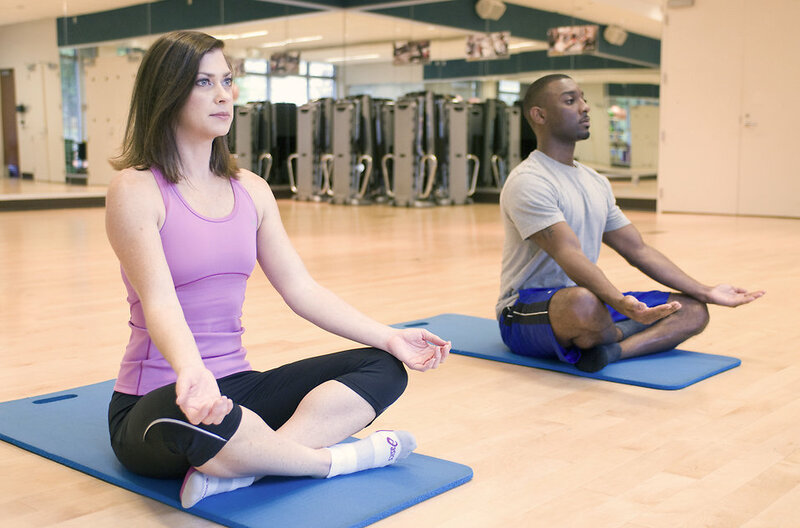 The South Suburban YMCA is welcoming with classes for diverse ages and fitness levels including gentle yoga, great for those new to yoga, aging adults, or people with injuries. The YMCA’s Restorative Yoga classes can are beneficial for athletes and help boost energy levels. Many people are already YMCA members and classes are FREE with your membership so why not? Not sure where to start? Of course, it is always best to work with an experienced instructor to make sure you’re doing to poses properly to avoid injury, but if you can’t make it to a class or want to see more of what Yoga is about, check out the library of free videos at www.doyogawithme.com. You can also look into one of the FREE International Day of Yoga events like the Iowa Circus Academy’s free class at the Des Moines Social Club. 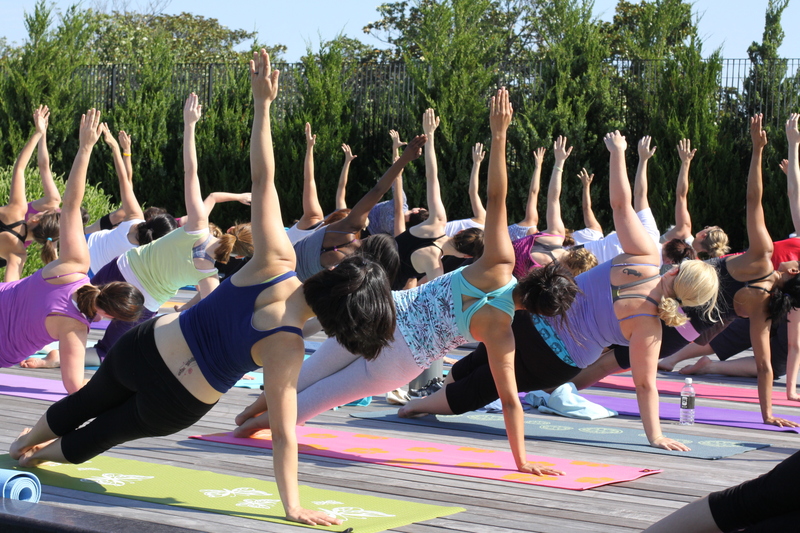 We know there are lots of excellent yoga instructors, studios, and pop-up classes throughout the metro. We’d love to hear from you, please share your favorites! Getting fooled by online tips? My Facebook and Twitter feeds are often full of health and beauty posts, but not all of it is sound (or accurate!). Pinterest is especially full of health and skincare tips of questionable benefit, or worse, potential for harm. With so many people posting and sharing information, it is easy to lose sight of what information is helpful, safe, and accurate. Is there contact information from the author on the site? How recent is the information? Is there a date when the information or website was last updated readily available? Are other sites or sources backing up the information? If you aren’t sure if something you read online is true, you can check it out at www.snopes.com! Yesterday I shared my favorite healthy holiday cookie, a vegan, gluten free, paleo friendly Pecan Sandy. Today I’m going to share yummy and healthier version of chocolate bark and buckeyes. Both are easily customized to your preferences too! 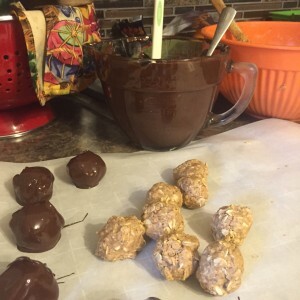 My friend Renae shared with me her favorite monster cookie protein ball recipe. 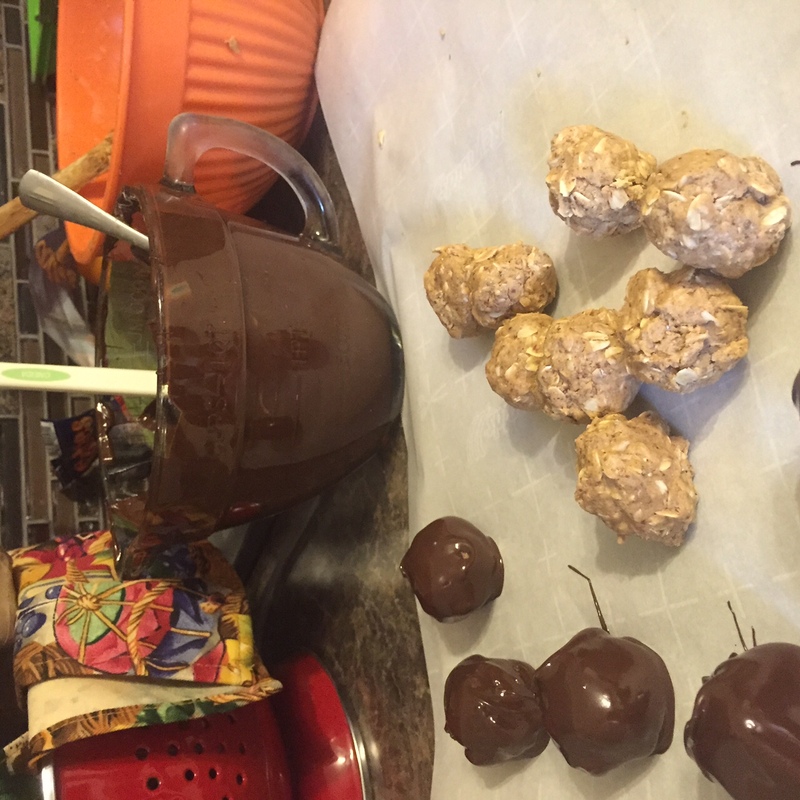 It was easy to adapt into a protein ball that was healthier, AND to dip into dark chocolate for a buckeye that had lots of protein and fiber, win-win! 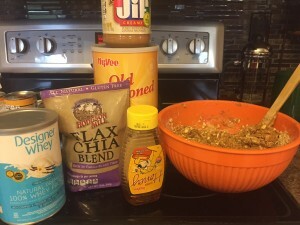 Combine all above, I found that starting with the peanut butter and honey, then adding the dry ingredients a bit at a time was best. If you can’t quite get them sticky enough to form a ball, add a bit more peanut butter or honey at a time. You’ll need to mix with your hands eventually. Roll into balls, then place on waxed or parchment paper. To be honest, they are delicious at this point without being chocolate dipped. 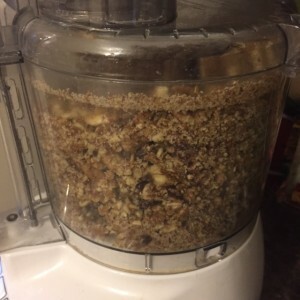 You can store then in the freezer for a quick protein snack or breakfast this way or continue with the next step. 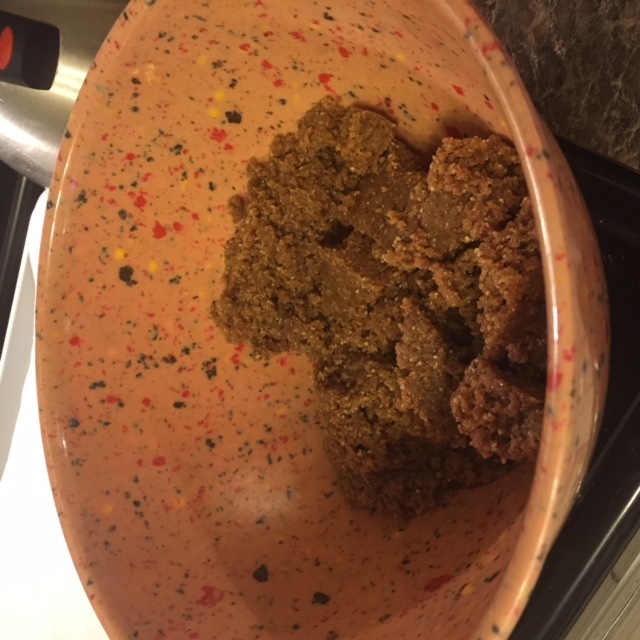 Melt chocolate squares in microwaveable bowl about 30-45 seconds at a time and stir each time until just melted. Drop a ball into the chocolate and roll until it is covered, then remove with a spoon and place onto the wax paper. Do this until all protein balls are covered in the dark chocolate, stopping to re-soften the chocolate or add more squares as needed. Place into fridge to harden faster. Store in fridge or freezer, depending on how quickly you’ll eat these. (Warning, it might be pretty quick-I had to tell my husband to back-off because they were so good). 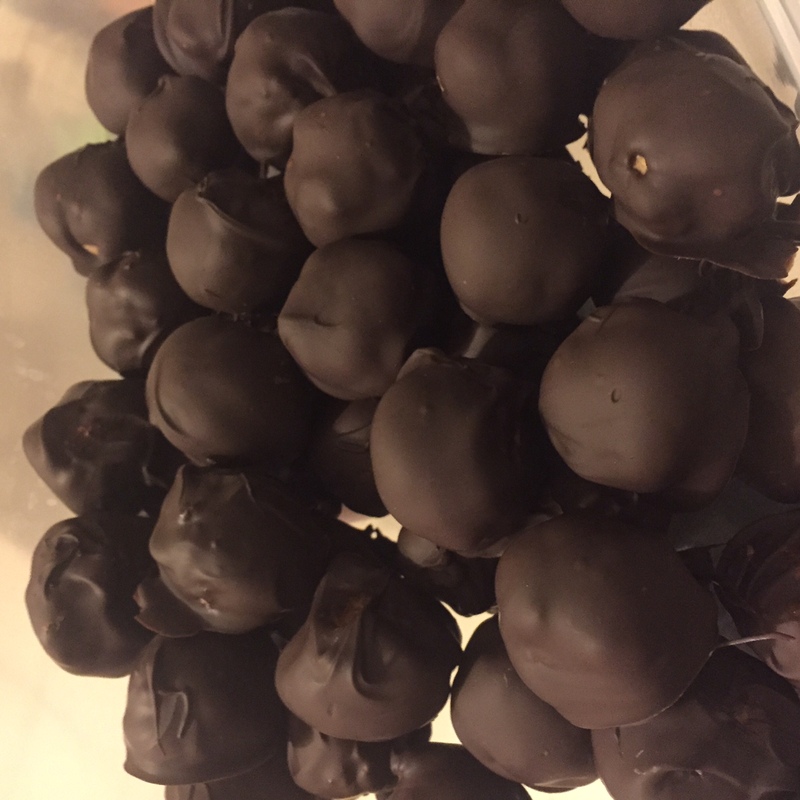 The finished protein buckeyes, ready for sampling at the Promenade (unless my husband finds them first). 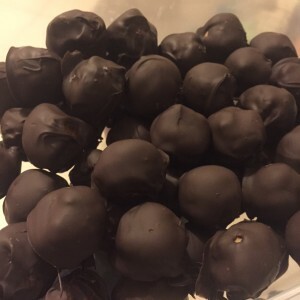 While these protein buckeyes do have more fiber, nutrients, and protein than regular buckeyes, do note they are certainly not low calorie and are ideal for active lifestyles or a grab and go breakfast replacement! I’m a sucker for holiday cookies, candies, bars, you name it. 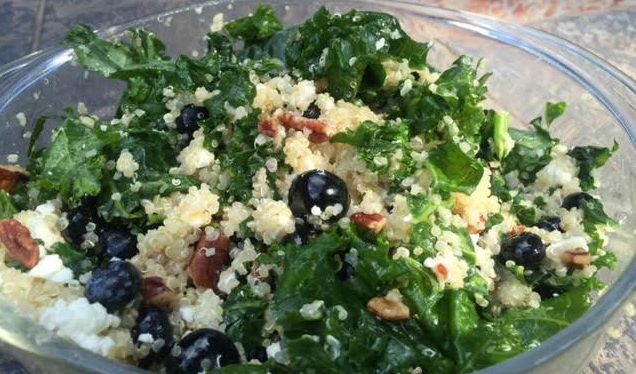 I also love finding recipes for healthier versions of said treats to find perfect recipes to please diverse crowds, from those who love decadent desserts to people who are vegan, gluten free, or have other dietary limitations. This year, I decided to make several healthier versions of classic holiday cookies to serve at our Holiday Promenade event, along with recipes, to inspire others to be creative. Sometimes my experimentation leads to hilarious cookie fails. 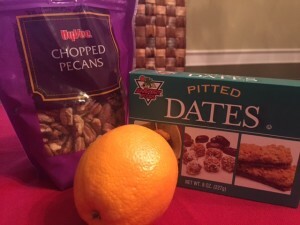 Last night one of my cookies had maybe one-too-many healthy substitutions and was deemed by my taste testers as “So bad that if you serve this at Holiday Promenade, you will RUIN Holiday Promenade.” My husband even asked if I made it with potatoes. This explains why my dog that eats anything in sight didn’t try to get the pan off the counter. And I just thought he was being good! nd ingredients. 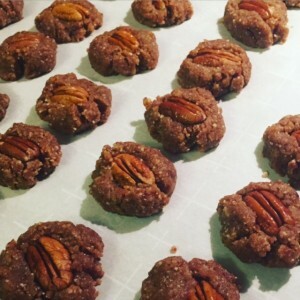 This is one of my long-time favorites: Healthy Pecan Sandies. 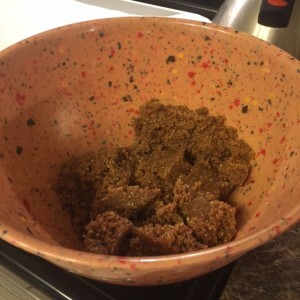 To make a raw version, make sure you purchase raw pecans (easy to find in health food stores or Trader Joes) and don’t bake your cookies, but prepare them and freeze in a single layer so they hold their shape. Eat out of the freezer as they’ll crumble as they warm to room temp if you haven’t baked them. Stay tuned for more healthy holiday treats recipes this week! Of all the self care massage techniques and tricks I’ve learned in 10 years as a massage therapist, the concept of reciprocal inhibition has been the most useful to me personally. Put simply, if a muscle is in spasm, you can stop the spasm by engaging the opposing muscle. I’m frequently awoken by charlie horses (calf cramps, or a spasm of the Gastrocnemius muscle). The natural tendency is to want to grab the muscle and massage or to stretch it out. This can help, but what works best is to engage the opposing muscle, the Tibialis Anterior, as both can’t be firing at once! 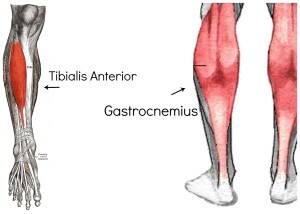 To stop the Gastrocnemius (calf) muscle from firing, you have to engage the Tibialis Anterior muscle. If you have a partner (or are helping someone else who is in the middle of a spasm in their calf) you’ll want to push their their toes toward the ground, then have them flex their ankle to bring their toes toward their body. Basically, have them resist you, thus engaging the muscles in the front of their lower leg (specifically, the Tibialis Anterior). In this photo, my partner is trying to push my toes toward the ground but I’m resisting so she can’t. This should stop the spasm right away. If you don’t have a partner (or you are courteous enough to not wake your significant other up in the middle of the night when you get a charlie horse!) you can apply the same principle yourself by using your other foot to push the against the top of the foot on the side with the spasming calf muscle while you try to draw your toes toward your body to resist the pressure. This technique can be applied to many different muscles, but the calf is an easy spot to start and a common trouble spot for many people. I have tried this successfully many times at 3 am. I’ve even applied the same principle during open water swim races when I get calf cramps by letting one of my feet press against the other foot and resisting. I don’t even have to stop swimming (just kicking) to do it! It has saved me from some serious issues in the middle of a lake. Curious about other applications for reciprocal inhibition or just want a more in-depth explanation? Click here for a good article! If you ever have the opportunity to test it out, I’d love to hear if it worked for you. Feel free to post a comment. When our massage therapist and certified Nia instructor Allison Peterson first approached me about teaching Nia at the spa, I wasn’t sure what to think because it seemed so out of our element, but upon further research, it seems like Nia is the perfect complement to our existing wellness services! Nia was developed in the 1980s as a way to provide aerobic, stretching, and strength training in a safe, non-impact format. Nia is set to music and draws from various forms of dance, healing arts, and martial arts. Nia enthusiasts enjoy that the workout is both energizing and relaxing at the same time. Alison recently did demonstrations of Nia at a spa event and it was a hit with the attendees! It was my first sample of the technique and I could pinpoint from the movements she guided us through exactly where my low back aches were stemming from. Nia is great for all fitness levels and will serve as a perfect way for people who are seeing our massage therapists to help with pain, balance and flexibility. Nia is even an appropriate fitness class for people who have Parkinson’s Disease, MS, arthritis and certain musculoskeletal conditions. Class size is limited. We are offering two 8-week sessions of classes. one on Thursday mornings 8:00-9:15 am and one Monday evenings from 5:30-6:15. We recommend signing up for as many classes as you can, but recognize that life, meetings, and vacations happen so you can sign up for individual classes online here, as opposed to committing to the entire 8-week session! Individual classes are just $15 and space is limited to 10 per class. Thursday morning session starts April 2, 2015, Monday evening session starts April 6, 2015.